Bring your own flamingo! Moochas gracias goes to Geenge for this perfect little specimen. I'm in Queensland, Australia where bunnies are illegal. My condolescences. Now whose sick perverted mind came up with the idea of making bunnies illegal? sadly, bunnyfiver, cute little bunny rabbits are not native to Australia and NZ They have no natural predators there and breed out of control. Rabbits are responsible for the extinction of several native plants and animals and to this day remain a serious ecological problem. Hi everyone!! I have a pet hedgehog and she is absolutely incrediable! She so sweet and loves to explore! Check out my link above for my pictures of her! Julia-Rose - a quick roadtrip to a petstore in NV should yield that hedgehog you so desire. Cute! Really? They are illegal? Why? I just have to say this is the cutest little outlaw I have ever seen, and I am an observer of "cute" almost everyday. Kudos for the Alice reference! That is so cute. Except in alice in wonderland They were pink and green!!!! but still very cute!! Does anyone remember Popples? They were little toy animals who folded into their pouches and looked exactly like this little guy... Too cute! 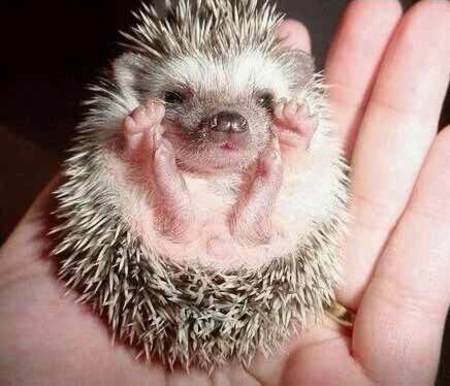 Hey I did the same pose as this hedgehog in yoga class yesterday! It's called the "happy baby pose." my instructor calls it the "dead bug." i think i'd rather come to your class, laurie. Yeah, you're right, Finn. It is "dead bug." "Happy Baby" is when you are in this position but also grabbing your feet with your hands.